Food as Power "We are suffering, in short, from a power famine as well as a food famine"
Shortly after the end of World War 2 in Europe, one of the quintessential boffins who had worked on the war effort turned his attention to the most pressing problem of the peace: a shortage of coal and oil. But where others saw the problem as a lack of transport, Geoffrey Pyke, saw a much more fundamental problem; a lack of food. Food required transport, and there was no fuel to power the engines. Pyke came up with a solution. Use the chemical energy in food to fuel muscular engines. 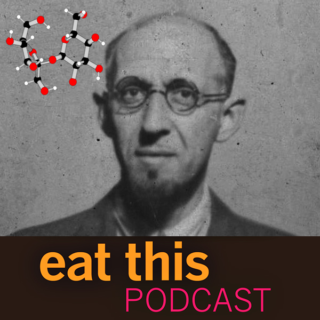 This episode is an abbreviated version of a paper on Food as Power: An Alternative View, which I am presenting on 30 May 2018 at the Dublin Gastronomy Symposium. The entire symposium is on Food and Power, so what’s alternative about my view? Pyke’s insight, that the production and transport of food requires muscular power, remains true today, and despite the very clear evidence and advice that Pyke offered in 1946, it also remains more or less ignored. Efficiencies of steam engine and human muscle compared. Apologies for quality; photographed on a monitor. 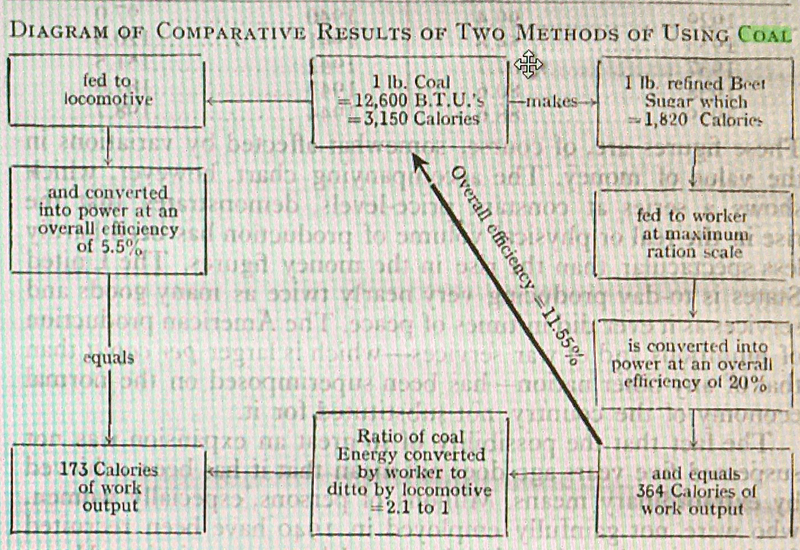 A pound of coal contains about 3150 calories, and if fed directly into a steam engine will produce about 175 calories of useful work. A pound of coal can also be used to refine sugar beets, in which case it will produce about a pound of sugar. The sugar contains about 1820 calories. Feed that to a man, and his muscles can turn it into about 365 calories of useful work. The man’s overall efficiency is about 11.5 percent, versus the steam engine’s 5.5 percent. Convert the coal into sugar, then, and you can get twice the useful work out of people than if you feed the coal to a steam engine. Half of the sugar–given the appropriate equipment– would be needed for the haulers taking the place of the steam engines, but the other half would be available to feed other workers such as coal miners, whose present output is so heavily reduced for want of food. Seventy years on, FAO estimates that muscles still provide 94 percent of the energy for global food production, about one-third animal muscle and two-thirds human muscle. One of the abiding problems is that women, who produce much of the food in sub-Saharan Africa, often have no choice but to use inefficient tools, designed for and bought by men. So metaphorical power also is relevant. But perhaps the saddest observation is that engineers have done masses of work to create tools and machines that make better use of the muscular power supplied by smallholder farmers and draught animals. These tools and machines have proved themselves in manifold trials on experimental stations, but they are ignored by the farmers for whom they were developed. The Colonial Office, in 1946, warned Pyke that it would be the people, not the equipment, that might pose a problem, and so it has proved. One report I read was rather plaintively subtitled “Perfected but rejected”. The 2018 Dublin Gastronomy Symposium on Food and Power takes place on 29 and 30 May 2018. My own paper Food As Power: an Alternative View is available for download, as are many of the other contributions. Theodore Gioia liked this article on twitter.com. Chris Selk liked this article on twitter.com. velo.promo mentioned this article on velo.promo. In 1946 Geoffrey Pyke, an eminently sane scientist, put forward the idea of using what little coal there was to refine sugar rather than feeding it to locomotives. Human muscles would make far better use of the energy than steam engines. The problem Pyke tried to tackle remains essentially unsolved: where is the power for food production to come from?